BURGER KING® is helping change the face of men's health by changing ours. BURGER KING® is helping change the face of men's health by changing ours. 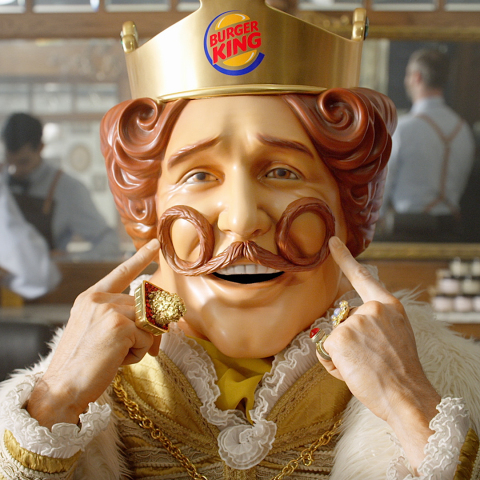 Today, the BURGER KING® King will shave his iconic mustache and grow a kingstache for the Movember challenge. A video of the King's transformation can be found here. Movember is an annual event involving the growing of mustaches during the month of November to raise awareness of men's health issues including prostate cancer, testicular cancer, and mental health and suicide prevention. The King encourages others out there to participate in the challenge and raise awareness for men's health by growing their own epic stache and sharing on social media with the hashtag #kingstachechallenge. "We are proud to show our support for this cause and hope our guests enjoy watching the King's mustache transformation throughout the month of November," said Alex Macedo, North America, for the BURGER KING® brand. The King will have his own profile on www.movember.com so the world can follow along with his journey. Founded in 1954, the BURGER KING® brand is the second largest fast food hamburger chain in the world. The original HOME OF THE WHOPPER®, the BURGER KING® system operates more than 15,000 locations in approximately 100 countries and U.S. territories. Almost 100 percent of BURGER KING® restaurants are owned and operated by independent franchisees, many of them family-owned operations that have been in business for decades. The BURGER KING® brand is owned by Restaurant Brands International Inc. (TSX,NYSE:QSR), one of the world's largest quick service restaurant companies with more than $23 billion in system sales and over 19,000 restaurants. To learn more about the BURGER KING® brand, please visit the BURGER KING® brand website at www.bk.com or follow us on Facebook and Twitter. The Movember Foundation is the only global charity focused solely on men's health, funding over 1,200 innovative projects across 21 countries. To date, the Foundation has raised $769M USD for men's health programs supporting these critical areas: prostate cancer, testicular cancer, mental health and suicide prevention. But our work is not done. Be the difference and go to Movember.com to donate or participate.